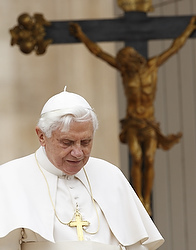 Jack Valero, a senior representative of Opus Dei, is defending the record of Pope Benedict in the pages of The Guardian. Valero addresses then-Cardinal Joseph Ratzinger's handling of laicization cases, including his efforts to more strongly enforce abuse investigations by bringing them under the purview of the Congregation for the Doctrine of the Faith in 2001. On Sunday I appeared on The Big Questions on BBC1 to discuss whether the pope should "resign". It quickly descended into a heckling circus where calmly reasoned argument fell victim to unfocused outrage. Afterwards, two representatives of the Protest the Pope Coalition told me menacingly I had "no right" to defend Benedict XVI's record on abuse. But shouting down the truth doesn't make it go away. I don't defend the pope because I think it is the duty of a good Catholic; I defend him because he is completely innocent of the charges made against him, and because the media has merged with the mob and misreported the facts. The three recent stories from the US cited by Richard Dawkins and his mob as "proving" that the pope should be arrested under international law – the horrible cases of Murphy in Wisconsin, Teta and Trupia in Arizona, and now Kiesle in California – have this in common: the abuse took place in the 1970s; the police were informed and acted; the priest was suspended by his bishop; requests for dismissal from the clerical state ("defrocking") were sent to Cardinal Ratzinger's department in the Vatican, the Congregation for the Doctrine of the Faith; and some time later the priests were defrocked – except in the case of Murphy, who died during his trial.